I decided that I needed to make more Easter houses for coworkers with children. 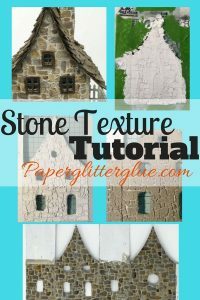 So I’ve cut out 10 little houses, made 10 bases, cut out 30+ pieces of grass for the base, cut some 40+ rosette cardstock for decorating the bases, make 60+ Sculpey eggs, etc, etc. 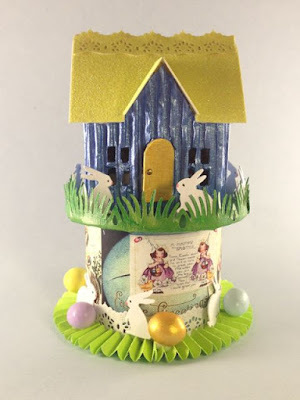 Well, during this prep phase for this next set of Easter houses I read about an online craft challenge that I thought just might work with one of the houses. It’s in a new blog called “Creative Carte Blanche” and every month the design team comes up with an idea to stimulate creativity. This month’s idea is to combine 3 disparate elements for creative inspiration – the elements are corrugated paper, lace, and metal. 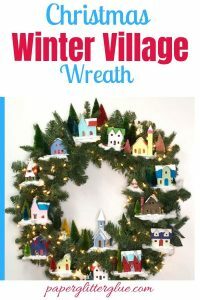 You are allowed to make whatever you want and interpret these elements as you want – meaning that metal could be metal tape, metal embellishments, or in my case – metallic paint. The challenge is called “Triple Trouble”. My Triple Trouble Bunny House does have way more than 3 bunnies. That could be trouble in itself. 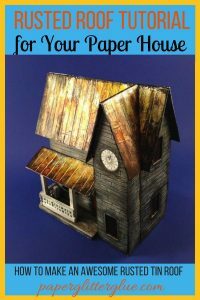 I cut the Tim Holtz Vintage Village house out of my usual cardboard and then covered it with corrugated cardboard. Corrugated cardboard by itself is not very strong and would not make a sturdy house. I did the roof the same way – making the usual cardboard roof and then gluing glitter paper on top. I added a layer of lace on the roof as well because the folded glitter paper makes an ugly seam and I wanted to cover that up. I used the blue pearlescent paint as the main color for the house. The base for the house is made like I did for my St. Patrick’s Day house. It’s a nice thick cardboard tube covered with paper and glued to a 4 inch circle. The top is made in a similar manner but I used a strip of paper underneath to make a rim that would insert in the cardboard tube so you can take the top off. Kids love to take the tops off. If I didn’t make it that way, they would. Now a treat can be hidden in there. I cut the grass out of painted card stock to make it a little more sturdy and glued it around the edge. An added layer of bunnies and Mod Podge makes the grass stronger. I decorated the circle on the bottom with 3 strips of Tim Holtz Mini Rosette paper. Folded in that manner it is very strong and gives some visual weight to the base. Then I glued down some Sculpey eggs including the golden egg and placed bunnies all around. The eggs, bunnies, and the rosette were also covered with 2-3 layers of Mod Podge for extra strength. 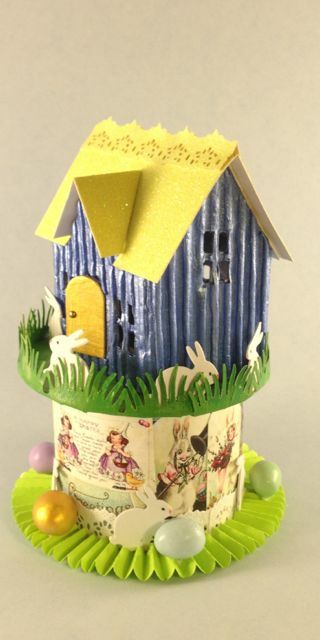 That is the first of 10 Easter Bunny Houses. I hope to assembly-line the next 9 houses, but it doesn’t usually work that way. I think of some new way I want to do something and it still takes me awhile to finish them. I have ONE week to go. I hope you have a nice, creative day. Lucy, this house is so incredibly cute! I can't believe you are creating 10 of these! I'm sure your co-workers will be thrilled with them – they are keepsakes for sure! It was such a great idea to cut the main part of the houses out of the corrugated cardboard! Every detail is amazing! So gad you shared your project with us at Creative Carte Blanche! We look forward to seeing more of your work in the future! Hey there, busy girl! This is so sweet. You've set the bar high for yourself. But it will be worth it, the kids will absolutely love these adorable little houses. Very clever to create a little space to hide a treat and how fun to do something that is "not a basket". Different and creative. Thank you for joining us at Creative Carte Blanche. Please do stay tuned next month, I'm hosting and have something fun planned for you! Lucy…your Bunny House is darling! So creative and festive. 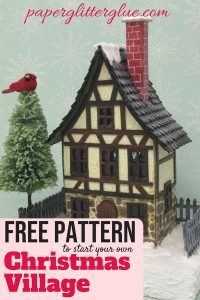 I love that you used Tim's house die cut and his rosette die cuts to create the base for the house. Love the colors! 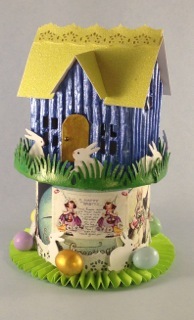 Love the little bunnies, the die cut grass and the eggs sitting around the base. Thanks so much for adding your wonderful art to our gallery here at Creative Carte Blanche. How super sweet this is and how sweet of you to make a bunch for your co-workers' children! They are sure to cherish these for years. I love that you used a large rosette for the base. Added whimsy! Adorable. Thanks for joining us at Creative Carte Blanche. Such an adorable little house. Very clever how you put it together. You are going to have a bunch of thrilled children!! Thank you, everybody, for those lovely comments on the Triple Trouble Bunny house. I'm still making more houses for other co-workers who heard about these houses. 4 more to go. Many thanks for your lovely comments about my first tag. Love, love your Tim holtz Easter houses. Great idea! I must have another play with my die. this is super cute Lucy! I love the base you made for them.